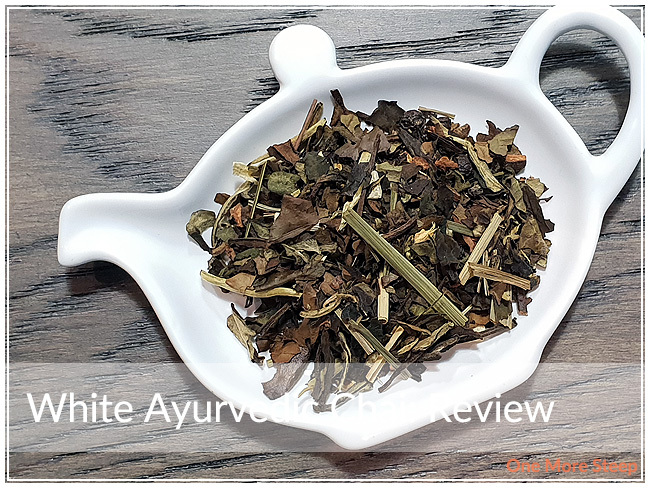 White Ayurvedic Chai came in a familiar foil bag that is resealable and features a print label that has all the information a tea enthusiast might need about a tea blend. The initial sniff of this white tea blend made me think mostly of cinnamon, ginger, and lemongrass. The cinnamon aroma is particularly strong and it really does overwhelm the white tea base as I can’t smell it all – although I can see it! I’ve never had a spicy chai that had a white tea base, and Adagio Teas’ White Ayurvedic Chai consists of: white tea, cinnamon bark, ginger root, lemon grass, cardamom, black peppercorn, natural spicy cinnamon flavour, cloves, dried coconut, pineapple pieces, and natural ginger flavour. I can see pretty much all of the ingredients, although I did have to give the bag a little shake until I found what I believe to be the dried pineapple. I love the idea of coconut and pineapple in a blend (piña coladas, anyone? ), and I’m hopeful that I will be able to taste them once the tea is steeped since I can’t smell them with the cinnamon (and other more aromatic ingredients). Adagio Teas recommends steeping White Ayurvedic Chai in 100°C (212°F) water for 5 minutes. I followed the steeping instructions for my initial steep. White Ayurvedic Chai steeps to a beautiful golden yellow. The aroma of the steeped tea is primarily cinnamon and ginger. The flavour of cinnamon and ginger are quite strong, there’s a gentle sweetness in the undertones that I’ll attribute to the fruity ingredients. The ginger and cinnamon offer a nice warming quality to the tea, it does a great job of warming me up from the inside out. I didn’t find this chai to be as spicy as expected (especially with an ingredient called “natural spicy cinnamon flavour”), but it still has nice warming, spicy notes to it. 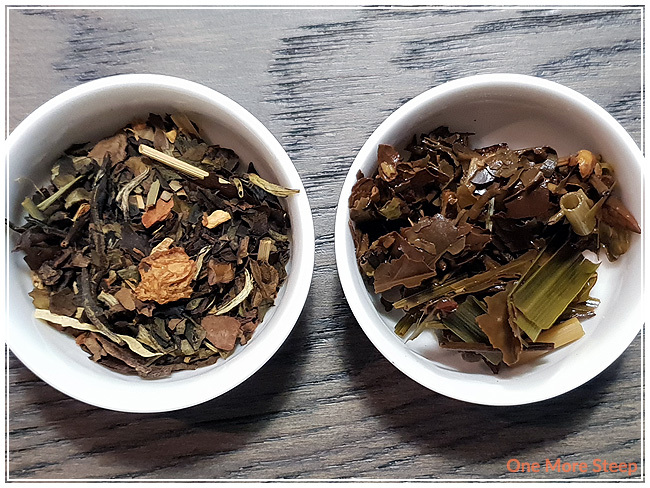 I do think that the white tea is quite delicate and light in comparison to the other flavours, but there is a soft floral note at the end of each sip that I think is from the white tea base. 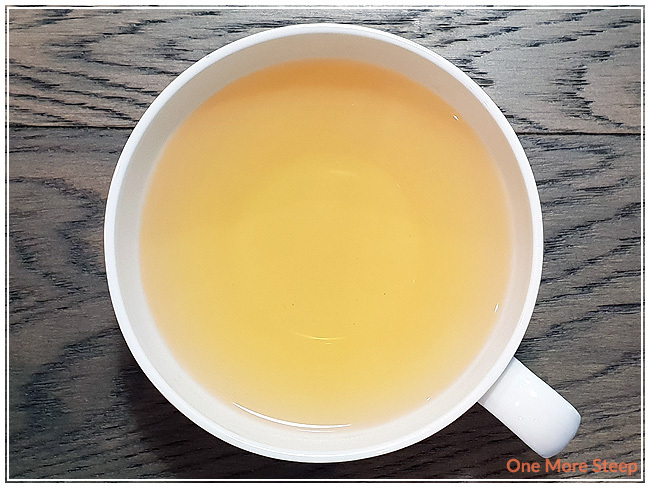 I attempted to resteep White Ayurvedic Chai and found it to be very watery in comparison to the initial steep, with minimal ginger and cinnamon flavours. I would say that White Ayurvedic Chai is good for just one steep. 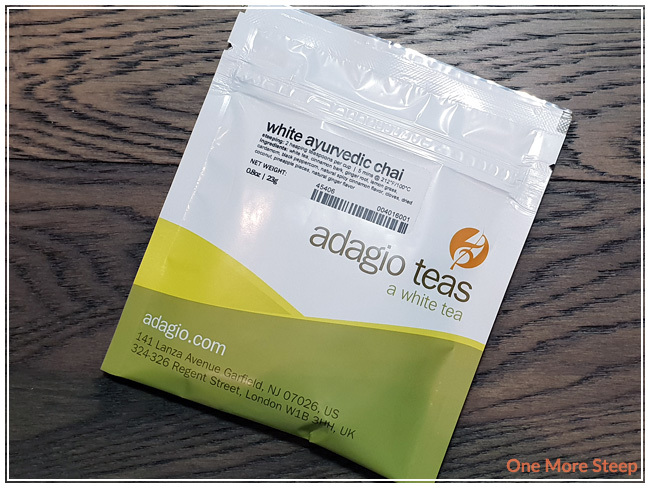 I liked Adagio Teas’ White Ayurvedic Chai. I was pleasantly surprised by the nuances in the flavour of this white tea blend when it was steeped. With the dry leaf, it was pretty much just cinnamon, ginger, and lemongrass that stood out to me. Once it was steeped, there was the fruity sweetness from the coconut and pineapple, as well as floral notes from the white tea base. It definitely surprised me – in a good way! I was impressed by the warming qualities in the tea and just how well balanced the tea was when I was drinking it. 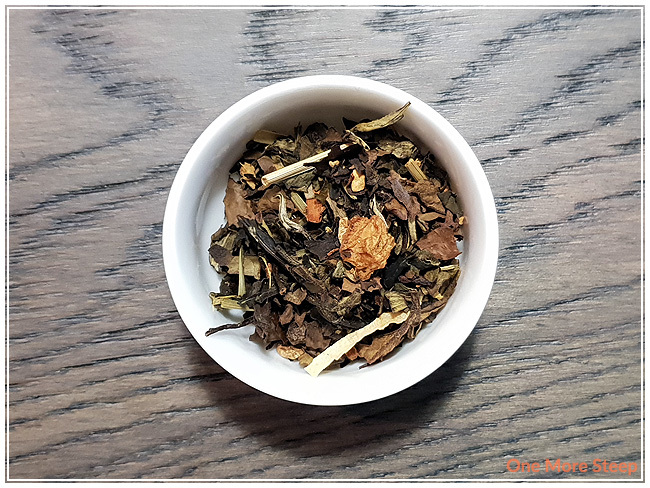 I do wish that it resteeped better, however I think that the flavours are fantastic in the initial steep and it’s worth a try if you’re looking for a nice chai blend with less caffeine!